The purple suited Foxy we all know and love opened Foxy Zero in late 2009. This move was in response to new sites such as Cheeky Bingo and Costa Bingo that had revolutionised the industry by offering free bingo with real cash prizes. The online bingo sites 'All the fun, zero the cost' tagline perfectly encompasses everything they are about, and to this day they are still provided thousands of loyal players hours of free bingo fun. 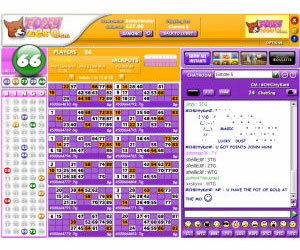 Foxy Zero is powered by the same Dragonfish/888 software as its more famous relative, but uses a more standard layout with fewer modifications so it does not feel quite as unique as Foxy Bingo. You are however welcomed by Foxy himself and the purple, yellow and white colour scheme is bright and cheerful and reassures you that you are still part of the Foxy Bingo family. The Foxy Zero homepage is basic but this is not necessarily a bad thing as it makes a real change not to be greeted by a page full scrolling banners and flashing text. The largest portion of the page is made up of a large graphic letting you know that cards start at 0p and there is a small box detailing the rooms that are open and how much you could win. The rest of the site is accessible via the navigation bar that contains links for promotions, guaranteed jackpot, games and winners stories. The lobby continues the simplicity of Foxy Zero with just four tabs; Free, 1p/2p Games, 5p/10p Games and Pre-Purchase. There are not many rooms to choose from which is a bonus as it funnels everyone into the same place and increases the value of the jackpots you can win. The main selling point of the site is of course the free bingo and there are guaranteed cash jackpots up grabs twenty four hours a day without ever having to spend a penny. If you have played at any other sites powered by the Dragonfish/888 software you will feel right at home in the Foxy Zero rooms. As always you have a large portion of the screen dedication to displaying you cards and a chat room where you can share some laughs with your bingo buddies. Just because you are playing for free does not mean you lose the support you have come to expect from the Foxy Bingo brand so you will always find a polite Chat Host on duty to guarantee things run smoothly. If you decide you want to play any of the other games available at Foxy Zero you can easily make a deposit and take advantage of their welcome bonus. Obviously the more you wager on cards the more you can win, especially if you take part in their pre-purchase guaranteed jackpot games. 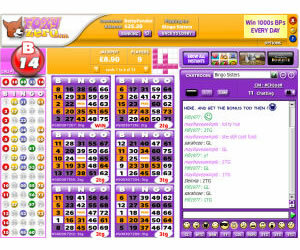 As a funded player you will also earn Bingo Points that can be exchanged for more free bingo cards. Foxy Zero does exactly what it says on the tin. 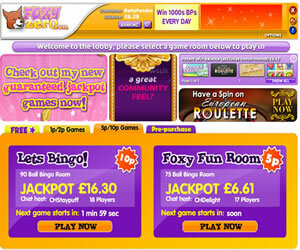 You won't find the life changing jackpots or the superb prizes offered by other brands, but that is the whole idea; if you want those things then head to Foxy Bingo. If however you want to have a great time, make new friends, enjoy your favourite game and win a little cash without having to spend a fortune, then you really should give Foxy Zero a try. 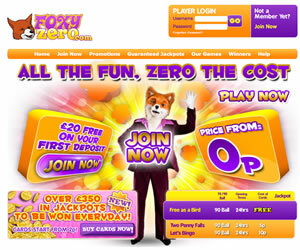 Foxy Zero offers 75 and 90 ball bingo, Multi line Slots, 3 line slots, casino, keno and instant win games. Foxy Zero's wagering requirements are 4x the total of the amount wagered plus the bonus funds. However, you can withdraw prior to meeting the wagering requirements but will forfeit any bonus funds remaining in your account.